Secretary CV examples are available here on this thread for job seekers. 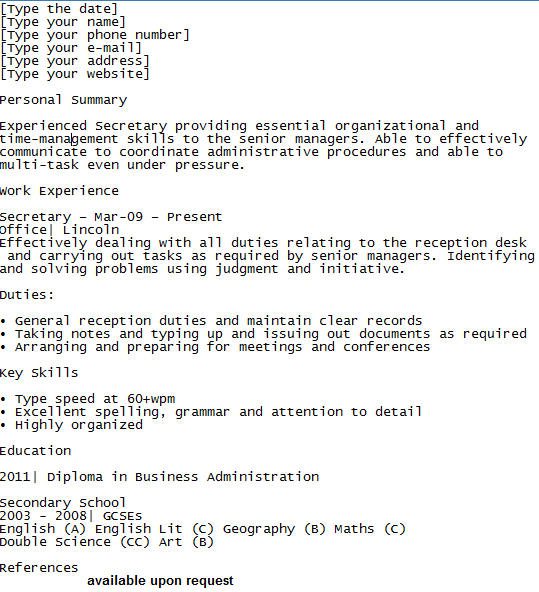 You can use the sample CV below for you job applications however don’t forget to replace the information with your own ones. There are many Secretary job vacancies in the UK, if you think you are good enough to be a Secretary then create your CV and apply for them. Experienced Secretary providing essential organisational and time-management skills to the senior managers. Able to effectively communicate to coordinate administrative procedures and able to multi-task even under pressure. Effectively dealing with all duties relating to the reception desk and carrying out tasks as required by senior managers. Identifying and solving problems using judgement and initiative.